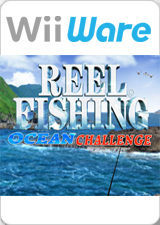 Reel Fishing Ocean Challenge - It's a thrilling fishing experience for novices and master anglers alike! The game's beautiful graphics, ocean setting, and intuitive controls bring the fishing experience to life. Each fish looks and moves so much like the real thing, it's the closest you can get to real-life fishing without putting on your waders! The graph below charts the compatibility with Reel Fishing Ocean Challenge since Dolphin's 2.0 release, listing revisions only where a compatibility change occurred. This page was last edited on 22 January 2018, at 09:34.